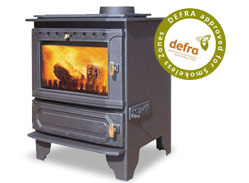 Dunsley Highlander 10 Multifuel Wood Burning Stove is a wide version of the popular highlander 8 stove, with the same burning control system but nearly 100mm wider than the 8 and with a fuel box area to take logs up to 550mm long, this makes the highlander 10 more suitable for larger rooms. Each door has its own primary air controls, these control the amount of fuel being burnt and can also be closed down for overnight burning of fossil fuels. * The Highlander 10 has a superb air wash system, designed to keep the glass clear. 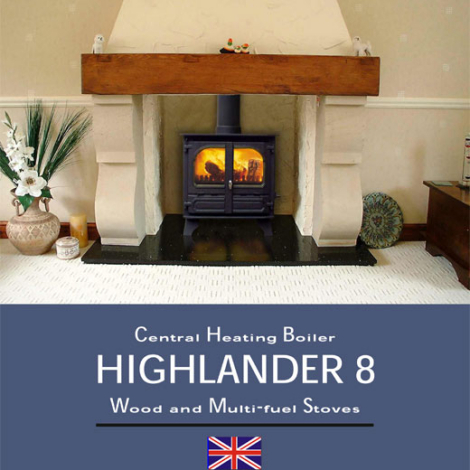 * With a heat output of 9-10KW maximum the Highlander 10 will easily heat larger rooms. * The grate mechanism can be adjusted for burning wood or other solid fuels including: peat, coal and coal briquettes. * The Highlander 8 is available with black, brass or polished steel knobs and is finished in metallic paint. Dunsley Highlander 10 Multifuel / Wood Burning Stove has a superb air wash system designed to keep the glass clean by diverting a warm flow of air directly over the surface of the glass. Each door has its own primary air controls, controlling the amount of fuel being burnt. With an output of up to 10kW, the Dunsley Highlander 10 woodburner is ideal for larger rooms, and the wide door opening allows it to take logs up to 550mm long. 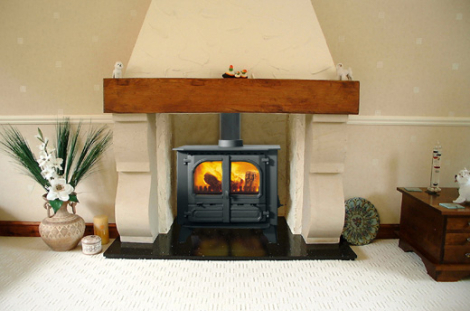 The Dunsley Highlander 10 offers a choice of door furniture as well as an optional canopy and boiler.